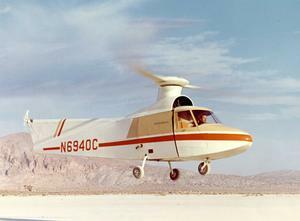 Full scale demonstrator for Irven H. Culver's 'rigid rotor' concept. First Lockheed helicopter to fly. This was the initial rotor configuration. Collective pitch was set at approximately 7 degs. 3 and 4 blade configurations were tried in an attempt to resolve vibration issues before the rotor was finally changed to a 3-blade configuration with aluminum blades. Resources related to the CL-475 , provided by the Vertical Flight Society. Resources related to the CL-475 , provided by public sources across the internet.